New legislation proposed in Minnesota attempts to crack down on activists who have exposed repeated animal welfare violations. Among its provisions, the bill targets anyone who documents an “image or sound” of animal suffering in a sweeping list of “animal facilities,” including factory farms, animal experimentation labs, and puppy mills. 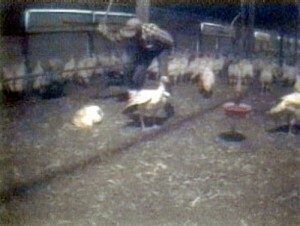 “Animal facility interference.” This provision targets those who, without the owner’s consent, “produce a record which reproduces an image or sound occurring at the animal facility.” Even worse, it targets those who “possess or distribute a record which produces an image or sound occurring at the animal facility.” In other words, these Republicans are not only targeting anyone who exposes abuses in these facilities, but anyone who distributes that information (presumably via DVD, or potentially YouTube videos). This is listed as a gross misdemeanor. “Animal facility tampering.” This provision targets those who take animals from these facilities. That, of course, is already a crime. But those provision also goes further, and includes “disrupting” the operations of such a facility. This kind of vague, overly broad language has also appeared in federal laws like the Animal Enterprise Terrorism Act. People have a right to know what, exactly, is a crime; vague language like this has a chilling effect on lawful activism, and can be misused by an ambitious prosecutor. This is listed as a felony. “Animal facility fraud.” This provision specifically targets undercover investigators and whistleblowers. It targets those who obtain access to an animal facility by “false pretense” (such as a false name on a job application, in order to document abuses). This is listed as a gross misdemeanor.